Electronics firm Sony is to shed 10,000 jobs as part of a major reorganisation, chief executive Kazuo Hirai has said. The cuts, which represent 6% of the global workforce, will be made over the next 12 months. The reduction includes staff working in businesses that are being sold, such as its chemicals division. Sony has been struggling to compete in the television business with South Korea's Samsung and LG, while Apple has challenged it in audio gear and phones. On Tuesday, Sony forecast a record annual loss of $6.4bn (£4bn), double its previous estimate. Its share price has fallen 40% over the past 12 months. 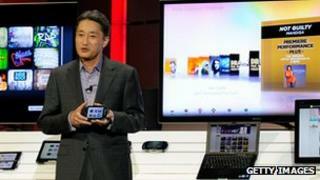 Sony says it will focus its business on three areas - digital imaging, games consoles and mobile devices. It hopes the changes will help to generate sales of $10.5bn by the financial year ending in March 2015, with a profit margin of 5%. In the last financial year, Sony reported sales of $7.9bn. "We have heard a multitude of investor voices calling for change. Sony will change," Mr Hirai - who took over as chief executive earlier this month - said at a press conference. "Sony has always been an entrepreneurial company. That spirit has not changed," he said. The reorganisation will cost Sony $926m (£581m) during the current financial year. But analysts have been underwhelmed by Mr Hirai's announcement. "I for one was expecting more," said Pelham Smithers, who runs his own consultancy specialising in the electronics industry. "This presentation has the same feel as a presentation made three to four years ago when the previous chief executive, Howard Stringer, tried to restructure." "But back then Samsung and Apple were not as powerful as they are today," he said. Toshiyuki Kanayama, senior market analyst at Monex, said: "I don't see anything new here. They've talked before about bringing the TV business back to profits. The comments about the electronics business are the same." "Nothing has changed from what they've flagged in the past, including the M&A plans in the medical field," he said. Sony's television business has lost money for the past eight years. Analysts say that while it sells about 20 million TV sets a year, it is still not big enough to be profitable. To tackle that problem Sony is planning to cut costs in the business by 60% by March 2014. "If they're planning to cut fixed costs by 60%, that signifies the closure of one factory, and the business can shrink. That's not necessarily a bad thing," said Kikuchi Makoto, chief executive at Myojo Asset Management. "The problem is that the plan is lacking in specifics on the plus side." The BBC's Tokyo Correspondent, Roland Buerk, said: "Mr Hirai wants Sony to find a new path by creating products that are really going to wow people." "But saying that is one thing, doing it is another." Rival Japanese TV maker Sharp is also forecasting hefty losses. It expects an annual loss of $4.7bn this year. What does the future hold for Japan's electronics firms?